The theoretical concepts used in the PYWALL software extend beyond the conventional method of analysis and design of flexible retaining walls based on limit-equilibrium theory. As a difference to conventional pratice, the PYWALL method includes the effects of soil-structure interaction. Modern methods of analyses of the behavior of reatining structures consider realistic soil conditions and relevant details of the structural system. Therefore, a rational method of analysis and design must include the nonlinear soil-resistance-displacement relationships, pile spacings, penetration depths and structural properties. PYWALL considers soil-structure interaction by using a beam-column model and can analyze the behavior of a flexible retaining wall or soldier-pile wall with or without tiebacks or bracing systems. PYWALL introduces the option to perform computation models of staged construction. This is a very convenient tool to study and to compare the predicted deflection, bending moment, and shear at different stages of construction based on a simplified approach. New p-y curve criteria for Weak Rock is introduced in PYWALL v3.0 and added to the previously existing six soil types. The interface in PYWALL v3.0 reflects various improvements to facilitate data input and to reduce the learning curve of the program. For instance, required input of soil properties now varies according to the selected soil type and new improved graphics references are used in various menus. New graphics displaying combined output of lateral movements, shear and bending moment along the length of the wall and in a single page for quick observation of results and to help users in the verification process. Displacement or rotational restraints, with linear elastic or nonlinear properties, may be specified at multiple depths of the wall to simulate bracings or tiebacks. Based on inputted geometry and soil profile, the program can automatically generate active-earth pressures with triangular distributions. Alternatively, the user may specify any type of distributed loading as active earth pressure acting on the wall. Passive soil resistance is computed automatically by the program using nonlinear soil-resistance curves (p-y curves). However, the user may also input any desired linear or nonlinear springs to represent the passive soil resistance at any depth below the excavation. Input parameters consist of the geometry of the retaining wall, structural properties of the wall element, restrained conditions applied on the wall by the tiebacks or other bracing systems, soil resistance curves, soil unit weight, strength parameters, and the water table. The program provides curves of wall deflection versus depth, shear force versus depth, bending moment versus depth, and the forces on any strut or tieback. Soil behavior is modeled with p-y curves internally generated by the computer program following published recommendations for various types of soils; alternatively, the user can manually introduce external p-y curves. Special procedures are programmed for developing p-y curves for layered soils and for rock. The program automatically generates group-reduction factors for timber-lagging walls and drilled-shaft retaining walls. The p-y factors are generated by the program based on the specified spacing betwen piles in the same row. Alternatively, users may input any external set of reduction factors to account for closely-spaced piles or for any other condition that may change the lateral response of the soils. 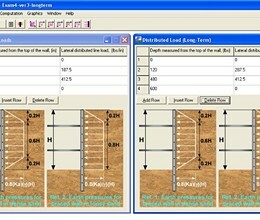 Allows users to specify a load factor to increase or decrease the magnitude of earth pressure generated by the program. 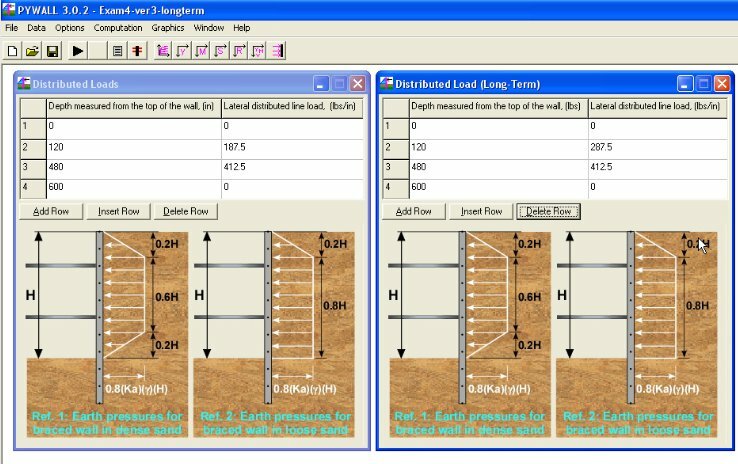 Allows users to specify a different height of the water table in the backfill side and the excavation side. Sloping backfill can be specified and when selected, the program can take this slope angle when generating earth pressures of triangular distribution acting against the wall. * PYWALL download link provides demo version of the software. No one has rated PYWALL yet. Be the first to rate this product.